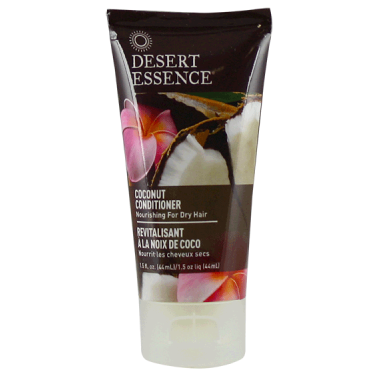 Desert Essence Coconut Conditioner features Organic Coconut Oil that softens hair and conditions the scalp, while emollient Organic Shea Butter helps dry hair retain moisture. This conditioner also has Organic Sunflower Oil that will leave your hair feeling and looking soft and silky without weighing it down. It's my favorite conditioner. I'm glad I found travel sized products not tested on animals and natural. It moisturize your hair but it doesn't feel greasy after. Really a good product. Fairly good conditioner. Scent is lovely, much more true coconut than the body wash in the same line. It hydrates well and left my hair shiny, but I found that the effect is only for that day, as the next day my hair felt rather dry. I have used this and only this lotion for years now. Non greasy and perfectly conditioning with the best coconut scent I've found!! I would recommend this over and over again.